The vitamin and minerals in Bee pollen include over a dozen vitamins, 28 minerals, 11 enzymes and coenzymes, and 14 fatty acids. It very well could be Mother Nature's multi-vitamin! Chances are that you take a multivitamin supplement. While I agree that it is important to supplement with a high potency, gender specific multi-vitamin and mineral supplement every day for optimal health, I believe it is even more important to include as many phyto-nutrients and phyto-chemicals as possible from nutrient dense foods. Scientists simply are not able to replicate all of the healthy compounds found in natural foods. There are those that claim we haven't even identified all of the substances in bee pollen yet. My point is this - compliment your multi-vitamin and mineral supplement with a tablespoon or two a day of bee pollen to make sure you are getting as many of the amazing nutrients that nature made for us as possible. In fact, I bet by doing so that you'll better absorb and assimilate of your vitamins and minerals by doing so. That means more vitamins in your system and less in the toilet. 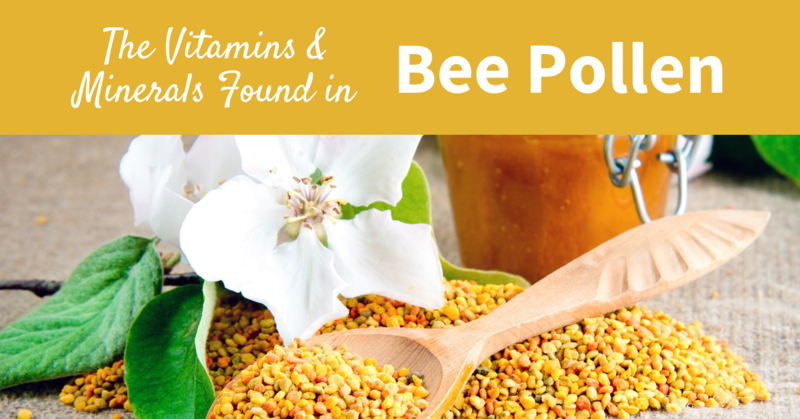 You will find many websites that claim bee pollen contains exact amounts of certain vitamins and minerals. This is not the case. Bee pollen can contain the list of vitamins below and it often does. But many things affect the actual amounts of these vitamins in a particular harvest of bee pollen including location, local plant life and temperature. This is why I fail to list specific amounts contained and any source that does list exact amount is not accurate unless they've had that particular batch analysed. This is highly unlikely since it is quite expensive to do so. I consider Bee Pollen to be Mother Nature's multi-vitamin. As you can see by the list below, bee pollen contains a wide spectrum of vitamins and minerals. It's these micro-nutrients that give bee pollen it's many health promoting properties. There are many websites out there as well as other published materials that claim that bee pollen contains all of the nutrients needed by mankind for complete and total health. I get asked about this quite a bit. While bee pollen is very nutritious and is a wonderfully healthy addition to a healthy diet, I don't recommend you attempt to live on bee pollen alone! I have had the good fortune of meeting a gentleman in the Dutchman's Gold shop who attempted to live on nothing but bee pollen and watermelon. And while he was alive, in my opinion, he didn't look healthy. So include as many fresh, natural whole foods in your diet as possible and eat a variety of colors regularly. Consider bee pollen the icing on the cake - it will help ensure that you obtain all of the healthy nutrients that Mother Nature intended.